The road to Holy Protection Skete, in Cossackdom’s Buena, NJ – is quiet and joyful. Sunrays gleam through the wild forest. A two-and-a-half-hour drive from New York City, about one and a half from Howell, NJ, where there is also a Cossack community and where in 1947 the World Cossack Association was founded – and we are greeted by a snow-white church and belfry, a newly paved parking lot with cars arriving from nearby and from neighboring states. Today is Sunday, March 3, the beginning of the week before Great Lent, the Sunday of the Last Judgement. It is the eve of Maslenitsa (Cheesefare). Coming out of the monastic cells – in fact, it is a house, where the first local priest lived – is our First Hierarch, Metropolitan Hilarion of Eastern America & New York, to prayerfully celebrate Liturgy in Holy Protection Church. Along the way, a pilgrim seeking prayer and consolation will notice that the place itself is unusual for America. This is Novaya [New] Kuban, as it was named in the beginning of the 1930s by the Cossack émigrés arriving here from the communist USSR.The city itself, according to Wikipedia is named Buena Vista (Buena Vista Township; "Good View" in Spanish), was officially established on September 1, 1948 just at that time, the main contingent of the Cossacks arrived locally – about 50 Cossack families. The local lands were much cheaper than in America’s big cities, and this attracted new Cossack immigrants. In the early 1950s, they bought hundreds of acres of land at a price of $ 20 per acre. Officially, the community was founded in 1953 and was named New Kuban in memory of the historic homeland of its inhabitants.New Kuban was built on Weymouth Road. A mark of the local Cossack settlement was the naming of local roads: Don Road, Kavkaz ("Caucasus") Place, Tereck Road, Simereck Road – all of these are names of places and rivers from where the settlers came. In the mid-1950s, members of the community erected an Orthodox church, which for decades served as the center of New Kuban and the surrounding communities. The church was consecrated byMetropolitan Anastassy (Gribanovsky; +1965), the second First Hierarch of the Russian Church Abroad. The icons for Holy Protection Church were painted by renowned Russian Diasporan iconographer Archimandrite Cyprian (Pyzhov; +2001); the iconostasis was painted by Bishop Daniel (Alexandrow; +2010) of Erie, at that time a priest. The years passed. The Cossacks left for the next world, and their relatives left for the cities. After the repose of the last rector, Archpriest Nicholas Nekludoff, in 2004, services in the church were held very rarely. For the last 21 years until the opening of the skete, divine services were not served at all, and the church property was left under the auspices of the rector of the neighboring Holy Trinity Church in Vineland, Archpriest Liubo Milosevich. In 2015, with the blessing of Metropolitan Hilarion, Holy Protection Male Skete was established at the former parish. A new rector – Abbot Tikhon (Gayfudinov) – was appointed to spiritually nourish and revive the community. Fr. Tikhon, a native of St. Petersburg and graduate of Holy Trinity Seminary in Jordanville, leapt to work on the improvement of the church building and the surrounding property. During its first Great Lent in 2016, Metropolitan Hilarion came to Holy Protection Skete and led the reading of the Great Penitential Canon of St. Andrew of Crete. This was the first hierarchal service in the skete in almost 25 years, since Metropolitan Vitaly (Ustinov) had last served there. At the same time, the First Hierarch personally took part in the "Clean Monday" drive – he, along with Fr. Tikhon and volunteers, cleaned up the skete for Pascha. And there was no end to the work to be done. The church and the basement – in which it had been decided to build a refectory – suffered from high humidity and rot. But for the meantime, that was the only place for both Fr. Tikhon and His Eminence to sleep; the parish house remained occupied. One year later, Fr. Tikhon could already show what had been accomplished at the skete: old plaster was removed from both the inside and outside of the church, the church was completely replastered and painted, air conditioners were installed inside the church and church hall. Gutters were installed to collect water, which had been lacking for decades. Cabinets and hoods were installed in the kitchen. The monastery grounds were cleaned, extra trees removed, and a metal fence and gate installed near the cemetery. The bell tower was replenished with bells, the belfry was fully furnished. Most importantly, the monastery finally gained access to the former rectory, which was quickly put in order. Today, after a car crash left the church wing badly damaged, the new entryway that was built to replace it was designed to provide safe access into the church for the elderly. Construction and restoration work continues all around the skete. Every first Sunday of the month and on major feasts, the community that has already formed around the skete gathered together to pray in church with the rector. 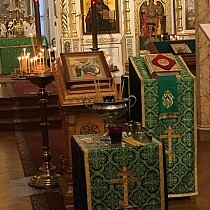 It is a joy that the divine services are often adorned by the visitation of holy icons or relics that visit from various places in America and Russia. In the summer of 2017, for the consolation and edification of the faithful, Metropolitan Hilarion brought a reliquary with pieces of the relics of various revered saints: the Holy Hierarchs Nicholas of Myra in Lycia and Spyridon of Trimythous, Venerable Sergius of Radonezh and Seraphim of Sarov, the Holy Great-Martyr & Healer Panteleimon, and others. That same year, an icon of the Protection of the Mother of God containing apiece of the veil of the Queen of Heaven, which had been traveling around the world, visited the skete for its patronal feast day. Visits to the skete have likewise been paid by the myrrh-streaming Hawaiian-Iveron and "Softener of Evil Hearts" icons of the Mother Holy Theotokos. ...which was founded for the Cossacks. This churchyard is a full Russian Orthodox cemetery located on skete grounds. In the shadow of the church domes, Orthodox Russians, Americans, Ukrainians, Serbs, and others lie at rest – those who were not indifferent to the location of their eternal rest. Fr. Tikhon and his helpers care for the grounds and the tombstones, and now the cemetery resembles a park: old trees have been felled, cherry blossoms planted, the headstones set upright, and the old graves cleaned off, below which reside the first parishioners, by whose labors the church was built. A large votive cross was erected, which has also become a symbol of the habitation’s rebirth and beautification, which increased month after month. The rector of the skete notes the importance of this cemetery for local Orthodox, in a locale with no other Russian cemeteries. At the current time, plots are available at the Protection Skete, with reasonable prices for people of every income. With the opening of an Orthodox skete in New Kuban, the First Hierarch of the Russian Church Abroad visits the monastery, setting aside time for solitary prayer. Here, Metropolitan Hilarion counts himself among the monks, and not only leads the divine services, but also fulfills obediences on the kliros and in the refectory. "Now there is a quiet corner of the Diocese where prayer flows unceasingly, where one can come to church and talk to God," His Eminence joyfully said. In the woods near the skete is a small house, behind which is a pine wood. The house itself is reminiscent of the cell of Elder Ambrose of Optina, and the pines – of the forest surrounding the Sarov Hermitage. If this land can be purchased, then there will be a place for more monks in the future, the skete can grow, and His Eminence can host pilgrims. On the eve of Great Lent, Metropolitan Hilarion wished everyone firm health, strength, and the aid of God and the Most Holy Theotokos. In honor of Abbot Tikhon’s birthday, the Metropolitan presented him a black set of vestments and reminded all that it was Fr. Tikhon’s arrival here that saw the transformation and beautification of this place, where the faithful can find spiritual nourishment and edification. On the first day of Cheesefare, the skete was visited by holy relics from Moscow. As a sign of the restoration of martial traditions, the President of the Holy Martyr Boniface Foundation, Matushka Natalia Mezentseva, presented Metropolitan Hilarion an icon of the Holy Righteous Theodore Ushakov containing a piece of his relics, and a gonfalon with an icon of the saintly admiral, both of which had been prepared by children. 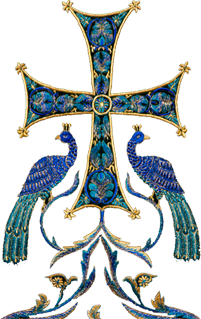 Matushka Natalia noted it providential that, although these holy items were destined for the Synodal Cathedral of the Sign in New York City, they were presented in this historic place, burial site of so many Cossack warriors of the Kuban and Don Voiskos. On behalf of the "Light of Orthodoxy" Foundation, Matushka Natalia presented His Eminence with the "Badge of St. Theodore Ushakov."